Golden rain, golden rain. I only wanted 2 see you laughing in the golden rain. Last year when we were in the Annapolis Valley in April, we made a stop at the Annapolis Royal Historic Gardens. They weren't open, and the growing season had just barely begun. But since we were there, and it was there, we decided "why not". 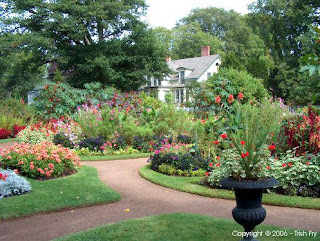 I have yet to make it to the Gardens in the height of the flowering season. Apparently their rhododendrons and roses are a sight to behold. Regardless we went in anyway. We were the only two in the still slumbering gardens. It was peaceful, to say the least. One could somewhat understand what the gardens would look like later in the year by the well planned "bones" that exist. As we rounded one corner this fantastic, gnarled umbrella of a tree came into view proudly standing in a manicured Victorian garden room. Underneath its branches were hundreds, if not thousands, of little paper husks, reminiscent of ground cherries. No sign was in sight to say what kind of tree it was. The trunk and shape of the canopy look fantastic, though – even with no leaves. Perfect winter interest specimen, I thought. In the photo above, the tree in question is in front of the white house, to the right (kind of behind the urn). No sign was in sight to say you couldn't take seeds, either. So since the place was deserted, I "liberated" three. When we got home I started to search for trees that had paper husked seeds. After some diligence I found it. 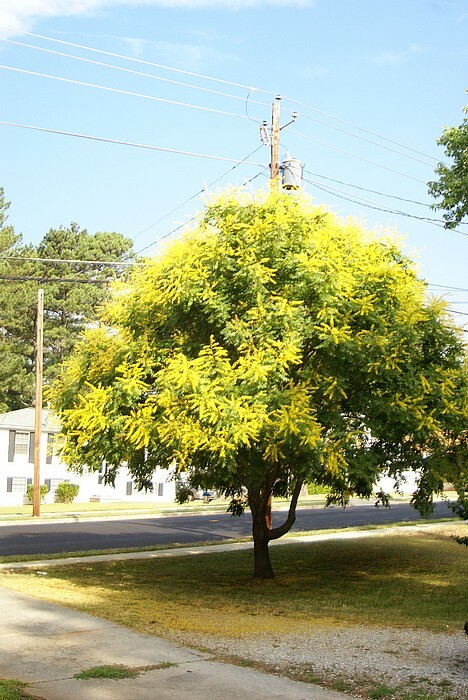 Koelreuteria paniculata, or Golden Rain Tree. 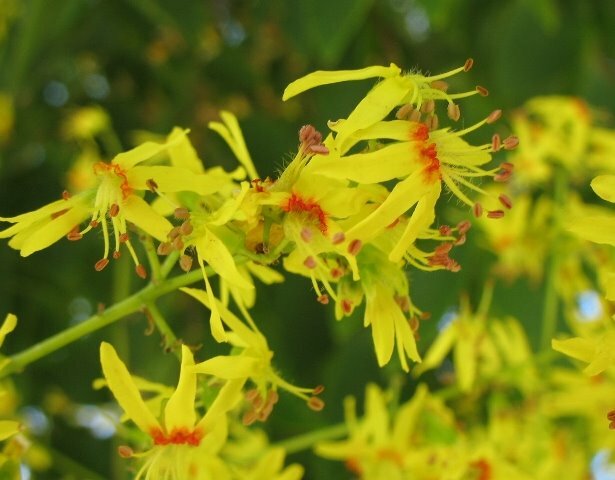 It gets its common name because when blooming (in summer) it is covered with tiny golden flowers which, after pollination, fall from the tree in a shower of gold. "Bright yellow flowers flair from the tips of branches. Although each flower is only ½” long, they appear in enormous numbers along 12” long and wide showy panicles. The act which follows matches the floral performance. Flowers become clusters of Japanese lantern papery pods. Lime green pods form in summer maturing to brown pods in fall. 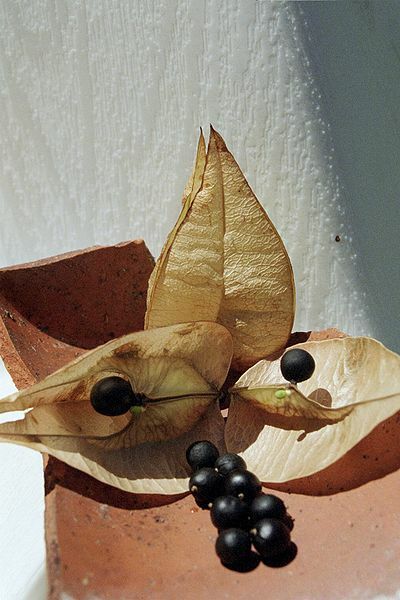 As a rule each pod contains three brown seeds. Rain tree foliage contributes a colorful subplot from spring to winter. Pinnately compound leaves bearing 7-15 leaflets emerge pink or reddish purple in spring before turning rich green in summer. Come fall leaves change to shades of orange, gold and bronze. Clusters of seed pods persist to ornament the winter garden." AND it's USDA Zone 5! So my quasi-thievery was for something that had four season interest. That's a first. Hopefully this entry hasn't cursed my endeavor. Currently only one of the three seeds germinated. It's a 4 inch twig sticking out of a pot on the window sill. The leaves did fall off when they should have in the fall. I water it regularly, even though it's winter, and look at it longingly every day, dreaming of the future. 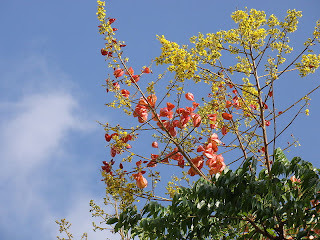 The leaves are pinnate, 15-40 cm (rarely to 50 cm) long, with 7-15 leaflets 3-8 cm long, with a deeply serrated margin; the larger leaflets at the mid-point of the leaf are sometimes themselves pinnate but the leaves are not consistently fully bipinnate as in the related Koelreuteria bipinnata. Koelreuteria paniculata var. paniculata. Northern China and Korea. Leaves single-pinnate. Koelreuteria paniculata var. apiculata (Rehder & E.H.Wilson) Rehder (syn. K. apiculata). Western China (Sichuan), intergrading with var. paniculata in central China. Leaves with larger leaflets commonly bipinnate. Invasive species in Nova Scotia? I think not. But if it is, that's a problem I'm sure I can "deal" with. If you like this post, feel free to retweet it with the link at the top right, or share it with any of the links beloow.